One of the best things about visiting and living in Southwest Florida is the waterfront dining. In this issue, I feature 3 local favorites. 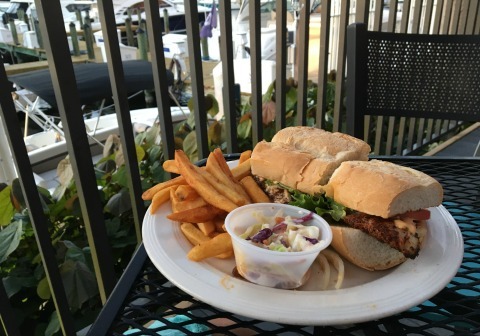 Although oysters are the specialty, I ordered and thoroughly enjoyed my Mahi Sandwich with Pineapple Cole Slaw and Fries at the Oyster House at Cape Harbour, located in the former Pignoli on the Harbour restaurant. If you sit outside, you can look at the boats docked in Cape Harbour Marina. Shop and stroll before or afterwards, or enjoy live music. I used to love going to The Sandy Hook out on Matlacha to watch the mullet jumping. 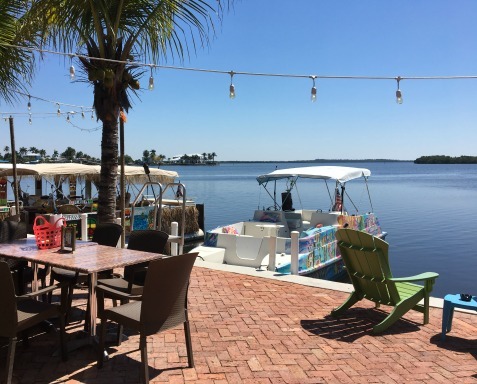 The restaurant is now called Yucatan and has new owners, a renovation with more water front tables, delicious seafood ...... and of course, great water views. BTW - I had their yummy Fish Tacos! 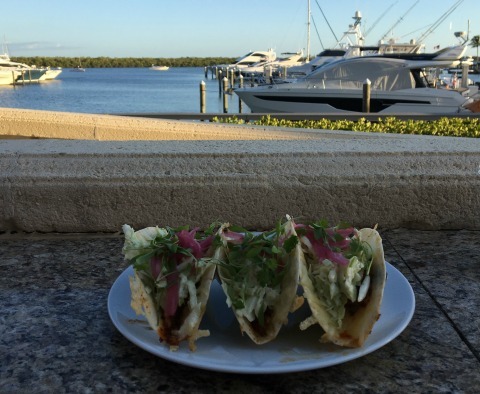 For the best Fish Tacos I've had yet, go to The Nauti Mermaid at the Cape Coral Westin. They're made with Blackened Mahi and topped with Cabbage, Pickled Red Onion, Jack Cheese, and Spicy Avocado Crema! You will also love the water views of Tarpon Point Marina. Don't forget to check out my soaps, body butters, salt scrubs and beach glass jewelry at Coastal Island Creations. Follow me on my Salt + Sea Soaps Facebook page. I'm at the Sunset Farmer's Market at Surfside Shops on Tuesdays from 1-6PM over near Woody's from October - May. Also from October - May, I'm selling at the Saturday Cape Coral Farmers Market at Club Square off SE 47th Terrace and SE 10th Place from 8AM-1PM. Buy Dale Werner's colorful Palm Frond Art to decorate your home, whether it's down here or up north! Heart and Soul Massage Therapy offers massage, Reiki, and spa services with the best prices in Cape Coral. Book your next Cape Coral fishing charter through FishingBooker right on my website! Karma and Coconuts is a gift and art boutique selling locally handmade art and crafts in Cape Coral. Sunset Celebration the first Wednesday of the month, October - May. Live music and Ladies Night at the Tiki Bar at Fathoms on Tuesdays and half-price pizzas on Wednesdays. More ideas for fun at Cape Coral Nightlife.